In this Philippine name, the middle name or maternal family name is Barbasa and the surname or paternal family name is So. 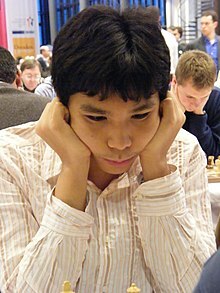 Wesley Barbasa So (born October 9, 1993) is a Filipino-American chess grandmaster. He is a three-time Filipino Chess Champion and was U.S. Chess Champion in 2017. On the March 2017 FIDE rating list, he was ranked number two in the world and had an Elo rating of 2822, making him the fifth-highest rated player in history. A former chess prodigy, So became the youngest player to pass a 2600 Elo rating in October 2008, breaking the record previously held by Magnus Carlsen. This record has since been broken by John M. Burke. In early 2013, So passed 2700 and in January 2017 he became the 11th player to pass 2800 Elo. So represented the Philippines until transferring to the United States in 2014. He won the 2015 Bilbao Chess Masters, the 2016 Grand Chess Tour title after claiming victory in the Sinquefield Cup and London Chess Classic, and the 2017 Tata Steel Masters. He represented the US on board 3 at the 42nd Chess Olympiad, winning team and individual gold. So was born in the Philippines in 1993 to parents William and Eleanor So; he has one older (by 1 year) sister, Wendelle So, and has one younger (by 13 years) sister, Wilma So. So attended the Jesus Good Shepherd School and went on to Saint Francis of Assisi College in Bacoor. He was nine years old when he began competing in junior tournaments. So took first place at the 2003 Philippine National Chess Championships in the U-10s section. As a junior player, he also competed in various sections of World Youth Chess Championships, finishing 19th in the U-10s in 2003, 13th in the U-12s in 2004 and fourth place in the U-12s in 2005. He also took part in the ASEAN Open U-10s in 2004, securing individual golds in the standard and rapid sections along with team silver medals in the standard and rapid along with winning individual golds in the standard, rapid and blitz sections in the U-12s in 2005. So made his tournament debut at the Nice International Open in August 2005, finishing in sixteenth place (from 159) with 4/7. He also completed three International Master norms in the space of four months, becoming the youngest Filipino to achieve that status after scoring 5/9 at the Dubai Open, 5½/9 at the San Marino Open and 6½/11 at the Dato Arthur Tan Malaysia Open. During this period, So made his first Olympiad appearance on second reserve board at the 37th Chess Olympiad held in Turin in 2006. So's form continued with 5½/9 at the Calvia Open, his first GM-norm with 7/9 at the Bad Wiessee Open, tying for sixth with 4/8 at the GMA Presidents Cup in Parañaque and ended 2006 by scoring 6/9 at the Singapore Masters. In January 2007, So qualified for the Chess World Cup 2007 via the Zonal tournament held in Phu Quoc, Vietnam, scoring 5½/9. Between January 2006 and April 2007, So had increased his FIDE rating by 303 points to 2519. In May 2007, he went on to become National Junior Chess Champion. So got his second GM norm by scoring 7½/13 at the 2007 World Junior Chess Championship in Yerevan. He achieved his third and final Grandmaster norm on December 8, 2007 at the Pichay Cup International Open (Manila, Philippines), thus becoming the youngest Filipino grandmaster at the age of 14 and the seventh youngest to reach the title. January 2008 saw So finish fourth with 7/11 at the ASEAN Chess Circuit event held in Tarakan, Indonesia. In April 2008 So shared first place at the Dubai Open, scoring 7/9. He also finished in third place with 7/9 at a blitz tournament held during the rest day. So then defeated Susanto Megaranto 4–2 in a six-game match as part of the JAPFA Chess Festival held in Jakarta, won the "Battle of Grandmasters tournament" with 8½/11 (+6−0=5) in Manila, came tenth with 7½/11 in the Philippines Open followed immediately with second place at the Subic Open with 6½/9. In July 2008, So came second with 12½/17 in a tournament to decide the team for the 2008 38th Chess Olympiad, followed by sharing eighth place at the World Juniors Championship held in Gaziantep, Turkey. He shared second with Zurab Azmaiparashvili scoring 6½/9 at the Vietnam Open but finished well back at the Arroyo Cup in sixteenth place. During the previous 3-month rating period So completed 69 rated games. After competing in the Asian Club Cup, So made his first appearance at a major chess tournament by winning the Corus Group C in January 2009, a point ahead of Anish Giri and Tiger Hillarp Persson with a score of 9½/13, earning a spot in Group B the next year. He scored 5/9 and shared 17th place at the strong Aeroflot Open held in Moscow. He showed his strength against home opposition scoring 9/11 at the Dapitan City Battle of GMs, but found it difficult at the Asian Continental Championships in Subic scoring 6½/11 and sharing 18th place. So won a seat in the 2009 Chess World Cup by finishing second at the Zonal Championship held in July 2009 in Ho Chi Minh City, Vietnam. After competing in the Chinese Chess League, So shared fourth place at the SPICE Cup Group A with a solid 4½/10. At the age of 16, So became one of the stories of the 2009 Chess World Cup held in Khanty-Mansiysk after progressing to the fourth round before being knocked out by Vladimir Malakhov after rapid tiebreaks. He defeated Gadir Guseinov after rapid tiebreaks then defeated Vassily Ivanchuk and Gata Kamsky. This was followed by sharing fourth place at the Corus Chess Group B in early 2010 with Erwin l'Ami scoring 7½/13 and sharing seventh place with 5½/9 at the Aeroflot Open. Sharing second place with 6½/9 at the Asian Continental Championships in April earned him a spot in the Chess World Cup 2011 and he secured a second Philippine Chess Championship. As So's playing strength and rating increased, so did the number of invites to high-level events. So initially led the strong Biel tournament before drifting back to share fifth place with 4½/9. Three weeks later, So held his own in the last NH "Experience vs Rising Stars" Match (played under Scheveningen match rules) scoring 4½/10 for the "Rising Stars" team. So took part in the 39th Chess Olympiad and placed fourth, scoring 5½/10 at the 2010 SPICE Cup, before the Asian Games. So tied for fourth place at Tata Steel (formerly Corus) Group B but withdrew from the Aeroflot Open, held soon after, citing exhaustion from the previous event. In July 2011 he won the Philippine Chess Championship for a third time. So's rating hovered over the coming year with a solid performance at the strong AAI International Tournament in New Delhi among performances typical for his rating. In 2012, So got a scholarship offer from Webster University, which was his affiliation for two-and-a-half years before becoming a full-time professional. In August 2012, So emigrated to the United States. In September 2012, So found success in first place at the Quebec International, scoring 7½/9, half a point ahead of Lazaro Bruzon and at the 40th Chess Olympiad drew against numerous top-level players including Levon Aronian, who described So as a "talented player from a country with a great chess culture". So came second in the Zonal 3.3 Championship in Tagaytay, Philippines earning a place in the Chess World Cup 2013 and shared first place with Pavel Eljanov and Bassem Amin at the Reykjavik Open. In doing so he breached the 2700 Elo mark, considered to be the level of an elite player and placed him 50th in the World. So also won gold at the 2013 Summer Universiade in Kazan, Russia, the first such medal for the Philippines, after a play off match with Zaven Andriasian. After defeating Alexander Ipatov in the first round of the Chess World Cup, he was knocked out by eventual semi-finalist Evgeny Tomashevsky. In October 2013, So won the Unive Crown Group scoring 4½/6. So tied for fourth with Fabiano Caruana and Lenier Dominguez at the 2014 Tata Steel Chess Tournament Group A scoring 6/11. He also won the 49th Capablanca Memorial tournament, held in Havana, a point clear of Lazaro Bruzon, soon after winning the ACP Golden Classic tournament in Bergamo, Italy with a score of 4½/6, a point ahead of Baadur Jobava. This string of tournaments propelled So to 12th in the FIDE World Rankings. So's transfer to the United States Chess Federation was confirmed in the November 2014 rating list. Soon after, he moved to Minnetonka, Minnesota to live with his adoptive parents, Lotis Key and her husband, Renato Kabigting. He won the Millionaire Chess Tournament held in Las Vegas in October 2014 scoring 8½/13 and shared second place at the Tata Steel Masters in January 2015. In June 2015, in the Dortmund Sparkassen Chess Tournament, he came in second, behind the winner Fabiano Caruana. So was awarded the Samford Fellowship in March 2016, enabling him to secure Vladimir Tukmakov as his coach. In August 2016, So finished clear first at the 2016 Sinquefield Cup, ahead of former World Champions Viswanathan Anand and Veselin Topalov, 2014 winner Fabiano Caruana, and 2015 winner Levon Aronian. He won 2 games and drew 7 games. In December 2016, So also finished clear first at the 2016 London Chess Classic, ahead of former World Champions Viswanathan Anand, Vladimir Kramnik and Veselin Topalov. He won 3 games and drew 6 games (+3−0=6). In winning the Sinquefield Cup, the London Chess Classic, and finishing second at the Your Next Move Leuven rapid and blitz tournament, he won the 2016 Grand Chess Tour. So's first appearance for the United States yielded individual gold medal for board 3 as well as team gold at the Chess Olympiad held in Baku. In January 2017, So won the Tata Steel Masters, finishing ahead of World Champion Magnus Carlsen by a full point, with a score of 9/13, to rise to World No. 3 in the next FIDE list. Wesley So played for the Saint Louis Arch Bishops in the Professional Rapid Online Chess League competition, winning all four of his games two weeks in a row. In week six, he and his team beat the division leader San Diego Surfers, which at the time had the only perfect record in the league. So won the 2017 U.S. Chess Championship by defeating Alexander Onischuk in a rapid playoff tiebreak. He won 3 games and drew 8 (+3−0=8) in the classical portion of the tournament. So had an undefeated streak of 67 games starting in July 2016, which ended in April 2017 after losing to the Azerbaijani GM Shakhriyar Mamedyarov who won the Shamkir Chess tournament. In June 2017, So scored 4½/9 at Norway Chess. So rebounded from seventh place at the Your Next Move Paris event with victory in the rapid portion of Your Next Move GCT (Leuven) with +5−0=4. He finished the tournament in second place with a score of 22½/36, 3 points behind winner Magnus Carlsen. In August 2017, So scored 3/9 at the Sinquefield Cup for tied last place. In September, So progressed to the semi-finals of the World Cup and was knocked out by Ding Liren on tiebreaks. Wesley So qualified for the 2018 Candidates Tournament as ratings qualifier in November 2017. He had a poor showing at the Candidates, placing seventh with 6/14. From 28 May to 7 June 2018, he competed in the sixth edition of Norway Chess, placing fifth with 4/8 (+1–1=6). He recorded his first victory over Carlsen in a classical game in this event. The young lad...would sacrifice a queen or any other pieces in his arsenal to get a winning attack....He cannot afford decent training given by well known GM-coaches and has to rely on his pure talent...before competing. So far I play aggressively. I would like to play a solid game with a solid opening. This is what I want. I think my style is close to Vishy Anand. Of course we have different level. His playing style has evolved in recent years to become more precise and risk-free, relying on taking advantage of opponent's mistakes. So has said that his favourite chess player is Magnus Carlsen. He has also said that his favourite game was his win against Ni Hua in the 2008 Chess Olympiad, which was his first win against a 2700-rated opponent. Position after 18...cxd4. White launched a spectacular combination with 19.Nxe6! So has been estranged with his biological family after they left for Canada and left him alone in Metro Manila. In the United States, he decided to live with Lotis Key, Bambi Kabigting, and their daughter whom he considers his adoptive family. He is a Christian. In an article for Christianity Today in August 2017, he stated that he reads the Bible every night and attends church every weekend. He has a younger sister, Wilma Barbasa So, and an older sister, Wendelle Barbasa So. So's favorite form of chess is chess960. ^ "Top 100 Players March 2017". FIDE. Retrieved 28 December 2018. ^ von Keitz, Michael (12 February 2013). "Carlsen's Conquests – at 22 he has broken all records". ChessBase News. Retrieved 2 March 2013. ^ Silver, Albert (31 August 2015). "September 2015 Ratings: Burke youngest 2600 ever". ChessBase News. Retrieved 1 January 2017. ^ "12 Open d'Ete de Nice – France". World Chess Federation. Retrieved 25 December 2015. ^ "All-time Tournaments – Tata Steel Chess". www.tatasteelchess.com. Retrieved 2017-12-30. ^ "The Week in Chess 795". theweekinchess.com. Retrieved 2017-12-30. ^ "Asia Continental Chess Championships 2010 | Chessdom Chess". reports.chessdom.com. Retrieved 2017-12-30. ^ "Wesley So Wins Philippines National Chess Championship | Chessdom Chess". reports.chessdom.com. Retrieved 2017-12-30. ^ Cox, David (9 April 2019). "Wesley So Interview: 'Chess Was A Way Out'". Chess.com. Retrieved 18 April 2019. ^ "Reykjavik Open 2013 : Three for the gold". Chess News. 2013-03-01. Retrieved 2017-12-30. ^ "World Cup 2.2: fifteen matches still undecided". Chess News. 2013-08-15. Retrieved 2017-12-30. ^ "One of the world's top chess players makes his move – to Minnetonka". Star Tribune. March 25, 2015. ^ "Carlsen wins Wijk Masters, Wei Yi wins B". ChessBase. Retrieved 31 January 2015. ^ "Fabiano Caruana wins the Dortmund Sparkassen tournament 2015 | The Week in Chess". theweekinchess.com. Retrieved 2017-12-30. ^ (PeterDoggers), Peter Doggers. "So Beats Giri In Blitz Tiebreak, Wins Bilbao Masters Final – Chess.com". Chess.com. Retrieved 2017-12-30. ^ "Wesley So partners with Tukmakov". Chess News. 2017-01-27. Retrieved 2017-01-30. ^ "Sinquefield Cup 9: Wesley wins it all". chess24.com. Retrieved 2017-12-30. ^ "Wesley So, double winner in London". Chess News. 2016-12-18. Retrieved 2017-12-30. ^ "Wesley So Wins 79th Tata Steel Chess Tournament". Retrieved 29 January 2017. ^ Copeland, Sam (16 February 2016). "Carlsen, So Topple Division Leaders In PRO Chess Week 6". chess.com. Retrieved 19 February 2016. ^ "Pairings & Results | Championship". www.uschesschamps.com. Retrieved 2017-11-28. ^ McGourty, Colin. "Shamkir 1–2: So's streak ends, Eljanov leads". chess24.com. Retrieved 2017-11-28. ^ "Levon Aronian wins Norway Chess 2017!". Chess News. 2017-06-16. Retrieved 2018-01-04. ^ "Paris GCT, Day 5: Carlsen wins despite MVL surge". chess24.com. Retrieved 2018-01-04. ^ "Grand Chess Tour – Leuven: Wesley So wins Rapid stage". Chess News. 2017-07-01. Retrieved 2018-01-04. ^ "Grand Chess Tour – Leuven Express: Magnus Carlsen runs away with event | ChessBase". En.chessbase.com. Retrieved 2017-11-28. ^ "Wesley So's so-so Sinquefield". Chess News. 2017-08-21. Retrieved 2018-01-04. ^ "FIDE World Cup 2017: And then there were two!". Chess News. 2017-09-22. Retrieved 2018-01-04. ^ "Kramnik to play 2018 Candidates". Chess News. 2017-10-30. Retrieved 2018-01-04. ^ Cardoso, Rodolfo Tan (2007-12-10). World's Youngest GM – GM Wesley So, age 14. ChessBase (Rodolfo Tan Cardoso), 10 December 2007. Retrieved from http://www.chessbase.com/newsdetail.asp?newsid=4313. ^ "Interview with Wesley So and Game Review from 2009 World Cup | Chess Blog of iChess.NET". Chess Videos, Chess DVDs, Chess Software and more. 2011-08-22. Retrieved 2017-11-15. ^ "GM Wesley So No-Loss Record Vs GMs with 2700+ rating". 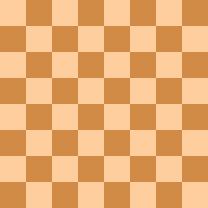 chessaccount. Retrieved 2017-11-28. ^ Catacutan, Dodo (13 July 2017). "How the Philippines managed to lose a potential world chess champion in Wesley So". Sports Interactive Network Philippines. Retrieved 13 July 2017. ^ So, Wesley. "I'm a Rare Breed: An Elite Chess Player Who's Open About His Faith". Christianity Today. Retrieved 2017-08-29. 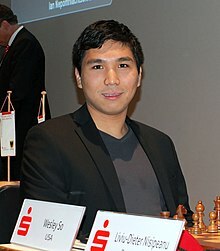 Wikimedia Commons has media related to Wesley So.